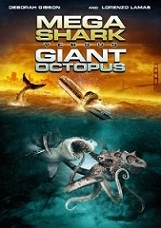 The next DVD title that we’ll be covering on the Saturday B Movie Reel will be Mega Shark vs Giant Octopus. This one was Debbie Gibson’s first Syfy movie. You can support our podcast by purchasing Mega Shark vs Giant Octopus on DVD here.